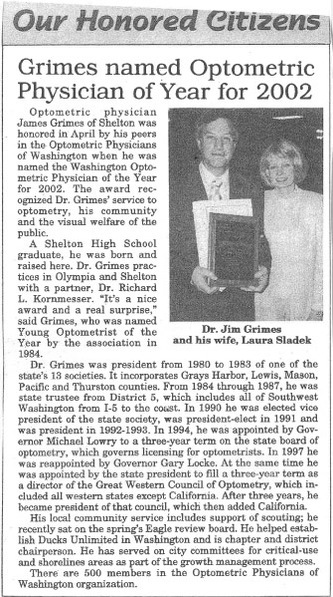 Optometric physician Dr. James H. Grimes was honored by his peers in April 2002 when they voted him the Washington Optometric Physician of the Year. This award is for service to optometry, service to community, and service to the visual welfare of the public. In addition to the April 2002 award, Dr. James H. Grimes was also honored by his peers in 1983 when he was voted the Young Optometric Physician of the Year Award. In 2005 Dr. James H. Grimes was honored with the Optometrist of the Year Award of the Great Western Council of Optometry. The Great Western Council of Optometry includes all of the western states except for California. "It's a nice award and a real surprise," he stated upon receiving the award.